As a dual US/Irish citizen, Emily Westbrooks chose to leave Ireland to avoid adoption red tape here. WE JOKINGLY REFERRED to our plan to start our family the “path of most resistance.” In retrospect, our idea to take a sabbatical from our Irish life to try to adopt a baby was highly ambitious. After a few years of trying to start our family naturally here in Ireland, we had been through the requisite fertility testing and were eventually told that our only guarantee of starting a family would be in vitro fertilisation or IVF. As we sat in the doctor’s office as he delivered that verdict, I burst into tears. The proposed solution just didn’t sit well with me at the time. It was hard for me to see all of our friends start their families when we had such a long way to go to start ours. To be constantly faced with reminders of what we didn’t have was exhausting. Adoption in Ireland was and is incredibly difficult. In 2017, just fifty-two adoptions were finalized in the entire country, and that includes domestic and intercountry adoptions. Domestic adoption is almost non-existent, and the process of intercountry adoption is like climbing Everest. In order to begin the adoption process, you have to be vetted by Tusla, a process that takes several years. You and your family and friends will be interviewed at length, you’ll have to prove your medical fitness, down to proving that you haven’t engaged in fertility treatments in the last six months and meeting a certain BMI. Your finances, past and present, will be combed through extensively. Because domestic adoption is almost nonexistent, most couples opt for international adoption, which is limited to say the least. Ireland only cooperates with about ten countries for international adoption, and you have to choose which country you’re going to adopt from at the start of your journey. And the cost, of course, is astronomical — between €35-50k for most programmes. In short, for someone living and working in Ireland, adoption is an extremely difficult process. So we decided to leave Ireland entirely. As dual US/Irish citizens, we had a support network of family waiting for us across the Atlantic, so we decided to give a temporary move a shot, for a year, or two, or as long as it took. If you’ve struggled with infertility, maybe you can identify with the feeling of wanting to escape and do something totally different. This definitely played a role in the leap we ended up taking, uprooting our lives in Dublin and starting over again in Houston, Texas. Because we are both allowed to live and work in the United States, we figured we’d just take a leap of faith. We’d take a sabbatical and find jobs and a place to live, and we’d start the adoption process in Houston, where we had family friends who had adopted years earlier. Five weeks after arriving in Houston, we got the call from the head of our agency on a sunny Wednesday morning. She said, “There’s a baby girl and we think she’s your daughter.” She was three days old and was waiting for us in the NICU. That evening, we walked into the NICU and met our perfect baby girl. 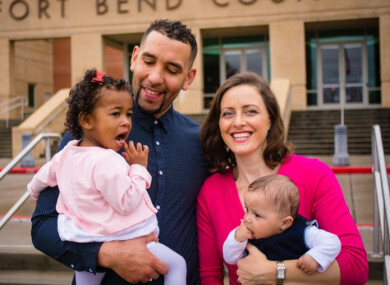 We are grateful every single day that Maya is our daughter, and that she came to us so perfectly and quickly, but adoption is never without a biological family’s heartbreak bigger than most of us will ever know. It’s a strange feeling, to be eternally grateful for a heartbreaking thing you wish never had to happen. Shortly after Maya joined our family, we decided to stay another year in Houston to try to adopt again. We spent a full year fostering infants, and initially thought that we might be able to adopt one of our foster babies, a little girl. But when she was unexpectedly returned to her birth family, we changed agencies and pursued infant adoption again instead. Two months after finishing our adoption licensing all over again, we got the call that our son was on his way. Just weeks later, we rushed back from a family wedding in Ireland to be there just 18 hours after he was born. We named him Noah Michael and he was exactly who we were waiting to join our family. We returned to Dublin this past summer, exactly three years after we left on our crazy adventure to start our family. We’ve settled into the life we hoped for and imagined for years. It’s not without its hard days, but it’s infinitely more beautiful and fulfilling than we could have imagined. Want to win a VIP day out at Winter Ladies Day at Naas Racecourse, with lunch and an overnight hotel stay? Enter here – and don’t forget to subscribe to our Family Newsletter below, too! Email “'Ireland's adoption process is like climbing Everest - and we were luckier than many'”. Feedback on “'Ireland's adoption process is like climbing Everest - and we were luckier than many'”.